As we enter the last days of summer, this author can’t help but notice that some houses for sale seem to have languished on the market for months unsold. 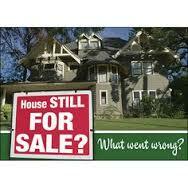 This post will address the practical and legal ramifications of unsold houses. Because “For Sale” signs from real estate agents cannot be posted on cooperative or condominium apartments, requiring potential purchasers to search real estate listings online or in the newspaper, this post will address houses only. In the suburbs surrounding New York City, most house sales occur with the school calendar in mind. For instance, a seller usually prepares her house to be listed starting in April, so that her buyer signs a contract by June, closes in August, and the buyer’s children can start school in the selected neighborhood in September. When the seller cannot follow this ideal schedule, she is limited to the buyers who are not concerned with the school calendar, which by its nature develops fewer potential buyers. If the property takes too long to sell, Thanksgiving and the holiday season arrive, along with winter weather, making buyers too busy or too uncomfortable to look at houses. First, we should discuss when a seller is legally committed to sell a particular property to a buyer. In New York, until both parties have signed the contract and the downpayment has been deposited, the seller may enter a contract with any other buyer of his choosing. Our attorneys who are involved in real estate transactions are prepared to act quickly in response to an accepted offer on a property. When representing the seller, draft contracts are sent to the buyer’s attorney usually within a day. Likewise, when representing a buyer, we negotiate the contract and prepare it for signing in a similar timeframe. Why would a property remain for sale for many months beyond other properties that readily sell? The seller may not be using a real estate agent and may have overpriced the property. Likewise, a real estate agent may have listed the property at too high a price and the seller is unwilling to reduce the price. There may have been another deal that broke up because the buyer could not obtain a mortgage or the property did not appraise properly. The house may need substantial repair work in order to be habitable. Buyers are well-positioned to take advantage of situations where houses have not sold after many months. If a buyer is willing to renovate the house on his own or hire a contractor to do so, the seller may be willing to reduce his price to make it worthwhile to the buyer. Especially if the buyer is not wedded to closing in time for school to start, the buyer will have enough time to renovate the house prior to moving in. Our firm awaits your inquiries concerning houses that remain for sale.